There is nothing like Mexican food in Mexico. Once you have had real Mexican food, you will realize that Taco Bell never was Mexican food. The best tip on finding a good Mexican restaurant in a tourist city is to get off of the main strip and find places that cater to the locals. All you need to do is look for restaurants that are full of locals. That tells you that they have good food at good prices. If, however, you are one of those people afraid of trying new things. Tijuana has Pizza Hut, Burger King, Wendy's (but no Taco Bell). 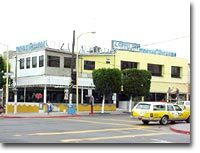 The Restaurants on Tijuana's main strip (Revolucion Blvd) also serve what they call "International Cuisine" -- Translation = sea food, steak, burgers, and other traditional north of the border dishes. Below are a few of the more popular places to eat in the tourist zone. However, for those who think they have eaten Mexican food north of the border, you really need to try the real thing. 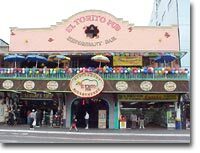 The El Torito Pub serves Mexican food, sea food, have live mariachi music, pool tables, and a mechanical bull. Located on the Revolucion side of the jai alai. Steak, chicken, and seafood dishes for $7.00 to $13.00 USD. Most dishes are under $10.00 USD. 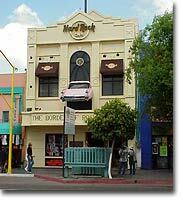 As with the other Hard Rock Cafe locations, you have a place to buy T-shirts, guitars and other Rock and Roll memorabilia on the walls, TVs with music videos playing and a bar. They have live bands Thursday, Friday, and Saturday nights beginning around 10:00 PM. 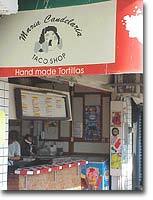 Great low priced tacos and burritos. Be careful when ordering the burritos, they are actually very large (and very good) -- you will be better off ordering one with 2 plates to share with a friend. Then you might have room for a side dish. The burritos (which are meant to be a meal) are around $3.50 USD.